He’s staying at Arsenal. He’s reached an agreement with PSG. He’s yet to talk to PSG an Arsenal have received no bid. All in one day. Wow! Pictures of Sanchez “spotted” in Paris: nil. The paper’s source is something called Paris United. We can find the twitter Page of Paris United – a fan page for PSG fans – but the link to the website is broken. 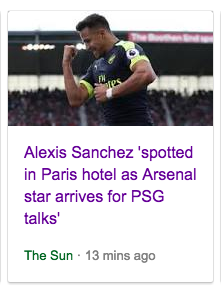 And like the Express, the site has no pictures of Sanchez in Paris – where he’s been “spotted”, but not by anyone with a phone on their camera. 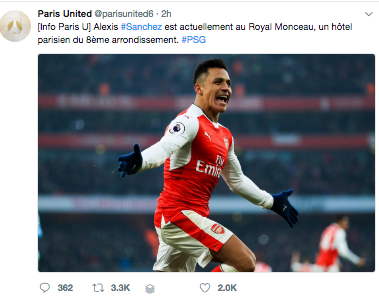 However, Paris United does tell its followers that Sanchez is staying at the Royal Monceau Hotel, aka ‘Raffles, Paris’. The Sun does not quote any source. And – like everyone – it provides no evidence of anything.